There are times when words just don't cut it, and I'm afraid the last post was one of those times. 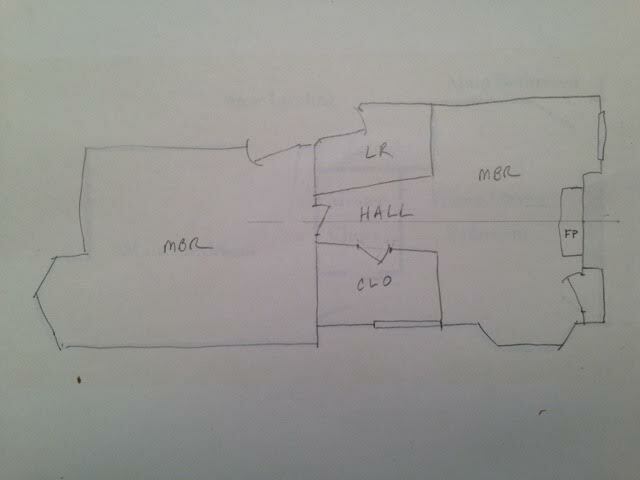 So, floor plans, drawn just poorly enough to still be useful! 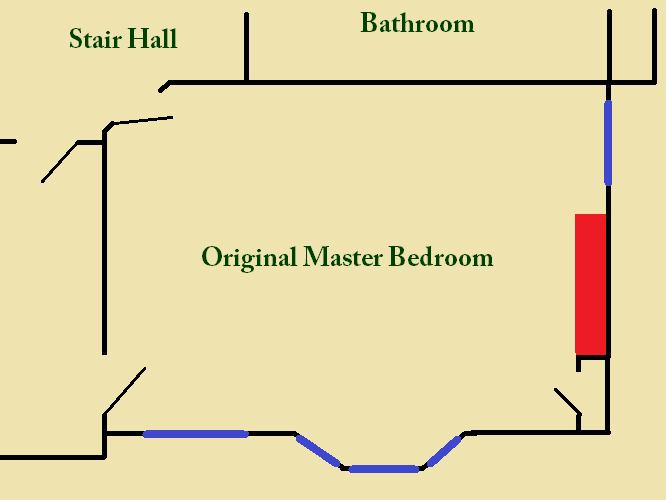 First, here's how the room was originally... The largest bedroom in the house, southwest exposure (stunning in the evenings), overlooking the original front of the house all the way down the hill which used to be part of it's estate (now filled with small infill 20's homes). Judging by the size and masculine fireplace, I'd guess that this was Mr. Kelly's room. His wife Agnes' likely adjoined on the left (our current master, and the smallest of the main bedrooms) given the art nouveau fireback, gas sconces, lincrusta, tower and feminine wallpapers. Next, the room as it was when we bought the house... Drop ceilings, no working electrical or plumbing, leaking badly, saturated with cat piss and missing moldings. What else, hearth tile missing where the wall was built on top, rotted corner where they had ripped out a window and not properly closed up the hole, missing flooring and burst pipes from the radiator freezing when the house was empty, caving in plaster and badly damaged double hung windows. I'm sure there's more, but that's enough to give me nightmare flashbacks. It's also the list for most every room in the house I suppose. An addition to these plans is Ross' fantastic entry - woe that we couldn't have made it work without major expenditures. 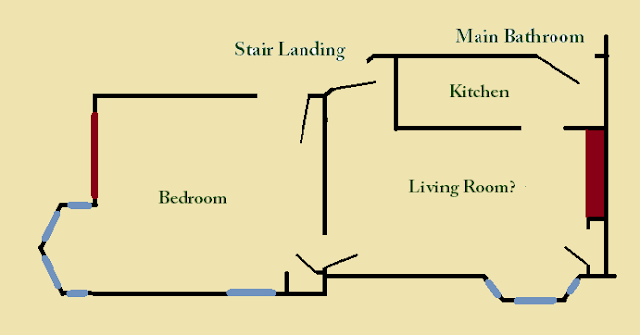 It also brought an issue to my attention - the basis for these drawings were done years ago now, there is in fact NO WINDOW next to the bay window in the bathroom. It was theorized at the time, and historical photos have proved we theorized wrong. How can I make the house work for today without destroying it? And I concur with your solution: lose 1 bedroom out of 9, to create an an expansive master suite. I am uncertain how much is built yet, but may I boldly propose an alternative plan? What I really love about old houses is that they have nice shaped rooms. 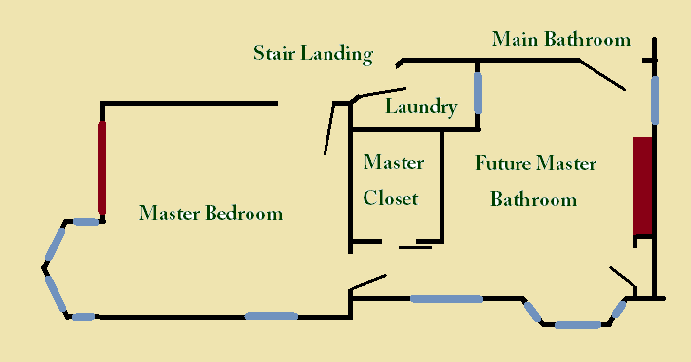 But the insertion of the laundry room and closet creates...a very odd shaped master bathroom. I drew a quick suggestion for your reflection, but do not not how to attach a plan to this comment, so will send it to your email address. I apologize in advance for such imprudence! No worries Ross, I actually would have loved to implement your plan. The walls are already built, accounting for issues not seen on the floorplan. We needed to maximize light into the (very dark) bedroom, and wall space in the closet, and account for the radiator that sits on the wall behind the doorway from the bedroom to the bathroom. I'll add your drawing though, and cry about what could have been! As I read this, I was thinking along the exact same lines as Ross. Please share his sketch so that the rest of us can see it. I am right there with you about the stress of restoration/renovation/updating an old house. Sometimes, the choices are easy and go off perfectly. Most of the time, though, we walk a tightrope between historical sensitivity and modern conveniences. I'm wondering if the sliding door to the master closet should be where it's drawn, or in the master bedroom, which looks like it would be more convenient for general access and also access with laundry to put in the closet? The master is quite small, so we couldn't sacrifice any unnecessary wallspace to a second door, nor is there room in either the laundry or closet for access between them. It's all very convenient as built actually, and it saved us from doing any serious changes to the original house. Changes are inevitable. Keeping the house a museum does it no good if folks don't want to live in the late 1800s. It's nice that you're really trying to keep the house true to its period. It looks like the new master suite will be fantastic when it's done.